I just finished writing the kids schedules for this week and thought I'd write about what we do, and how we do it. Jason and I both teach the kids, so we needed a system that allowed us both to know what was going on at all times (or at least most of the time). At the beginning of the school year I get out my trusty The Well-Trained Mind book, stare at my bookshelves for a while, and figure out what we want to do for the year. I write a list for each child of what I want them to accomplish by the end of the school year, listing the specific books, and then ordering them as necessary. I have to do this ... there's no way I'd remember otherwise. That list gets taped to the wall and largely ignored until someone finishes a book and we need to know what they do next ... then we just look at the list and voila ... couldn't be much easier. The lists get used at one other time ... when I'm writing the list I look at past lists to see what the other kids did at the same time. This year I only had to look at old schedules to figure out who was doing what ... and I had our annual schedule for four kids done in maybe 10 minutes. Below is last years annual schedule. The kids generally do the same science and history, just with differing amounts of help from us, and we'll sometimes combine other subjects too, like M. and I. doing the same Writing Strands. Other than that their work is geared toward them and is usually not the same as what anyone else is doing. 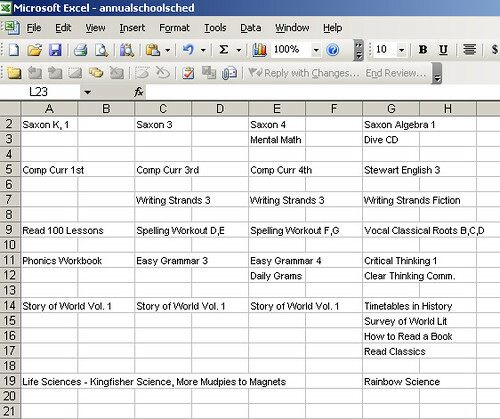 Every Sunday evening I sit at the computer and do the spreadsheet for each child's weekly schedule. They each get their own schedule, which Jason and I keep on a clipboard. As they finish something it's checked off the schedule. 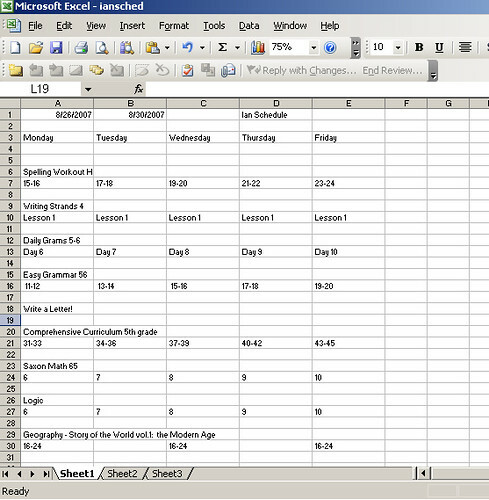 The kids can look at their schedule and know exactly how much they have to do for the week and get ahead if they wish. K. is madly in love with the idea of getting checks on his schedule and that's really motivating him right now ... works for me! If the kids go to the shop on a school day they just grab their schedule and books and go. Now, with all these schedules it might seem like we're really rigid. We're not, at all. If a child doesn't get everything done, and there's a logical reason for that it just gets carried over to next weeks schedule. On I. 's schedule above he was supposed to do Writing Strands lesson 1 last week and didn't get to it, so it's now on this weeks schedule. There aren't that many lessons in the Writing Strands book, so it's no big deal if he doesn't do a lesson a week. But the schedules do work well for us, really well, and we'd be lost without them ... we know, we've tried and it was disasterous. The kids each have 4 3 ring binders to store their work in - language arts, math, science, and history. Each binder is divided into sections as needed. Newly completed work goes in on top of the correct section. At the end of the year when it's time to be reviewed we grab the binders and go out the door. As long as we've kept up with filing the work we're all set and everything we need is right there. This past year we didn't keep up with the filing and it took a good morning to do half a years worth of organizing. After reviews we pull the old work out of the math and language arts binders and start filling them again with new stuff. Science and history we don't pull, we just keep adding to those binders. Once upon a time I splurged on a kitchen island for myself, our kitchen is large and there's never enough counter space for all of us, so the island seemed like a great thing to have. Well, that's what we store their school books on. One pile for each child. And I've never cut or cooked anything on that island. It stays pressed up against a wall and covered in books. It didn't take long to realize I was never getting that island back so I got a bigger, better one that no one is allowed to put anything on. This was supposes to be short and quick. Ooops. Well, I hope it was helpful to someone. Thanks for posting things like this. I love to get the behind the scenes look at homeschooling so I can start thinking. thanks for sharing! we're trying to work out a schedule right now, too! we're starting school next week.